Your garage door won’t go up. It won’t go down. Broken spring? Problems with the opener? When you run into problems with your garage door, often times you need it fixed fast and you always want it fixed by a company you can trust. Platinum Overhead Door is that locally owned and trusted partner! We’re experienced professionals having worked for years throughout the North Atlanta area – from Buckhead up to Alpharetta and Marietta over to Lawrenceville. Of course, we’re licensed, bonded and insured. We offer same day service… often within minutes. And we’re there for those emergencies on nights and weekends. Better yet, when we finish the job we even sweep your garage for you. Every repair is based upon our Platinum Process and includes a free inspection of your garage door. When you give Platinum Overhead Door a call, we strive to provide you with a comprehensive quote over the phone. Once an appointment has been made and prior to our visit, you are notified via text, email or a phone call when our technician is 30 minutes away. All of our technicians are trained, certified and capable of providing you with the repair or install service you need. Just as importantly, all of our technicians are background checked to provide you peace of mind. 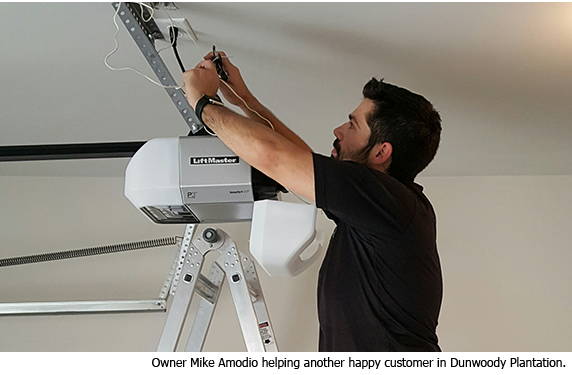 Once on-site, our technician will go through a multi-point inspection of your garage door and garage door opener. Our technicians will make recommendations to you based on their assessment and walk you through their findings and our quote. Upon your approval, we will make repairs, replace parts or install new doors. Nearly every repair can be made with one visit to your home. We guarantee all of our work and we’ll even sweep your garage out for you before we leave.